Giant chairs are something of a theme in public art. The one in the cartoon is no doubt (given Bill Griffith’s proclivities) a real one, but I haven’t located it. However, there are plenty of others around; here, Geneva, Switzerland; Washington DC; Hampstead Heath in London; Dartmoor, Devon; and Denver CO. 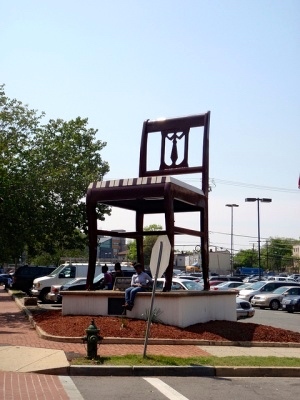 Chair is a public artwork designed as an advertisement by Bassett Furniture, located at the intersection of Martin Luther King Ave. and V Street S.E., in the Anacostia neighborhood of Washington, D.C., United States of America. Chair was originally surveyed as part of the Smithsonian’s Save Outdoor Sculpture! survey in 1994. 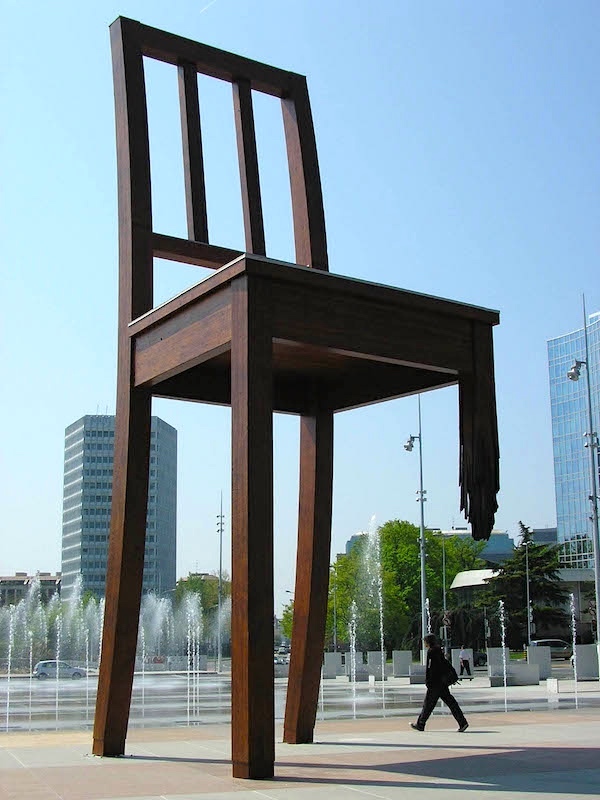 It was once considered the world’s largest chair, but has been overtaken by works like Broken Chair in Geneva [just above] and the temporary The Writer on Hampstead Heath in London [just below]. The 30ft (9m) sculpture, The Writer, will be on Parliament Hill for four months before returning to Italy. The tribute to the loneliness of writing is meant to inspire visitors to the heath, which has associations with writers Keats and Coleridge. … Giancarlo Neri, who used to play soccer for New York Apollos in the seventies, chose the heath, one of London’s most popular parks, after hearing of its artistic heritage. The Naples-born artist used six tons of steel and 1,000lb of wood to create the giant sculpture. 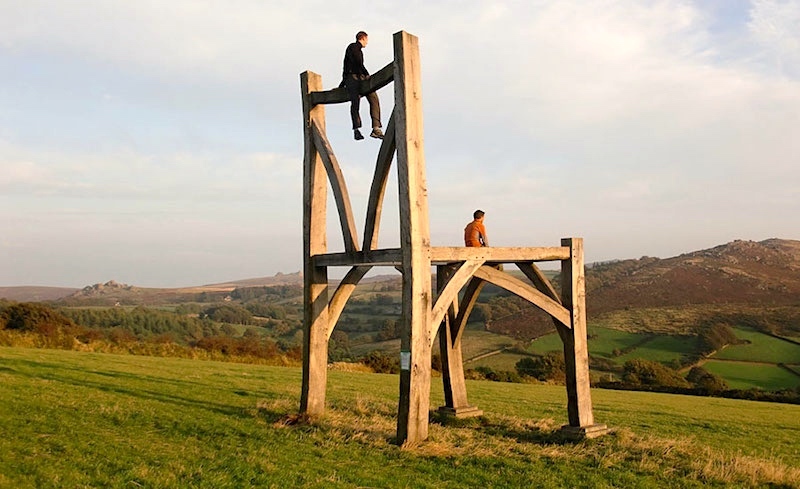 Giant Chair by Henry Bruce, Dartmoor, England: This extraordinary project is located north of Widecombe in the Moor on Dartmoor, Devon. Constructed by Henry Bruce from green oak, it stands in a superb location overlooking the surrounding landscape. Then a 7/22/10 report on BBC News: “Dartmoor Giant’s Chair goes into storage – for now”. The construction was pulled down because it was erected without planning permission and “attracted too many visitors”. It was put into storage, and I don’t know what’s happened to it. 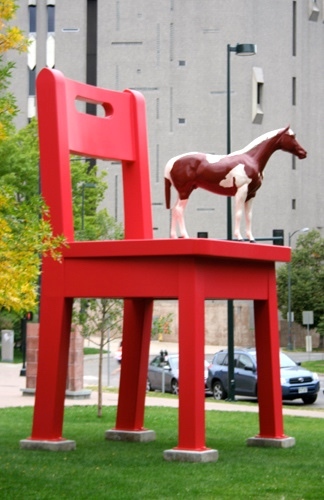 The red painted steel chair is 21 feet tall and ten feet wide, and the painted fiberglass pinto pony is six feet tall at the ears. The scale of this work is meant to recall that time in life when even everyday objects seemed monumental. “The Yearling” was originally commissioned for an elementary school in upper Manhattan. Says Lipski about this work, “I wanted to give kids something that would really be a cause for wonder.” When the school district asked Lipski to omit the horse, he refused, saying, “It just lost all its magic.” The sculpture spent 1997 in New York City’s Central Park, where it was widely acclaimed before traveling to Denver in 1998 for permanent installation. There are more, many more. 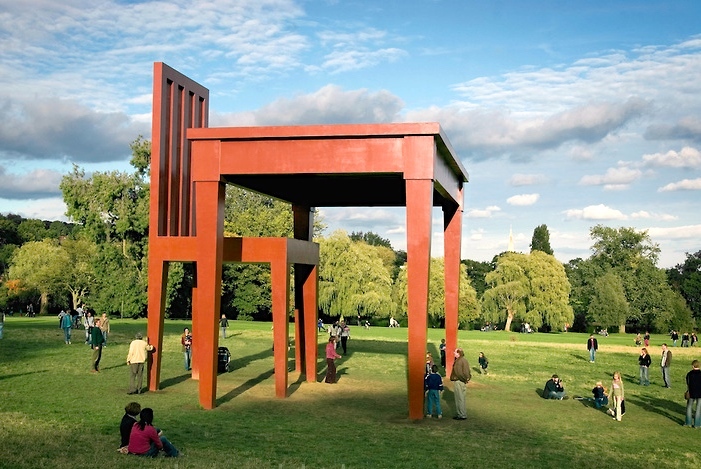 Chairs are big in the (public) art world. 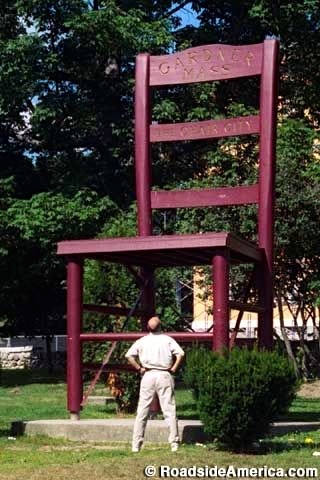 One of a series of outdoor giant chairs — each one larger than the last — erected since 1905 in this self-proclaimed “Chair City of the World.” The current model is 20 feet, 7 inches tall and weighs 3,000 pounds. This entry was posted on May 28, 2016 at 12:17 pm and is filed under Art, Linguistics in the comics. You can follow any responses to this entry through the RSS 2.0 feed. You can leave a response, or trackback from your own site. Looks like the real one that looks most like the one in Zippy is the Bicentennial Giant Chair in Gardner, Massachusetts. The OKC chairs are not as huge as the ones above, but the weird proportions make them eerie. The chairs are located to form a matrix of where the people were in the building when they died. All this on the basement level of the building, overlooked by ragged remains of one building wall, forms a moving remembrance. With not a bit of language, there is something powerfully communicative about chairs.